Transition into stylish with the tailored and timeless Sam Edelman Aven mule. Textile upper with embroidery detail. Slip-on design. Point-toe, smoking slipper silhouette. Man-made lining. Lightly cushioned footbed. Low wrapped heel. Leather outsole. Imported. Measurements: Heel Height: 1 1 4 in Weight: 7 oz Product measurements were taken using size 7.5, width M. Please note that measurements may vary by size. Weight of footwear is based on a single item, not a pair. Your signature look gets a flirtatious fringe accent with the simply classic Sam Edelman Halan pump. Available in variety of textile uppers. Slip-on design. Point-toe silhouette. Man-made lining and insole. Double padded footbed. Wrapped stiletto heel. Leather outsole with synthetic heeltap. Imported. Measurements: Heel Height: 3 3 4 in Weight: 7 oz Product measurements were taken using size 7.5, width M. Please note that measurements may vary by size. Weight of footwear is based on a single item, not a pair. 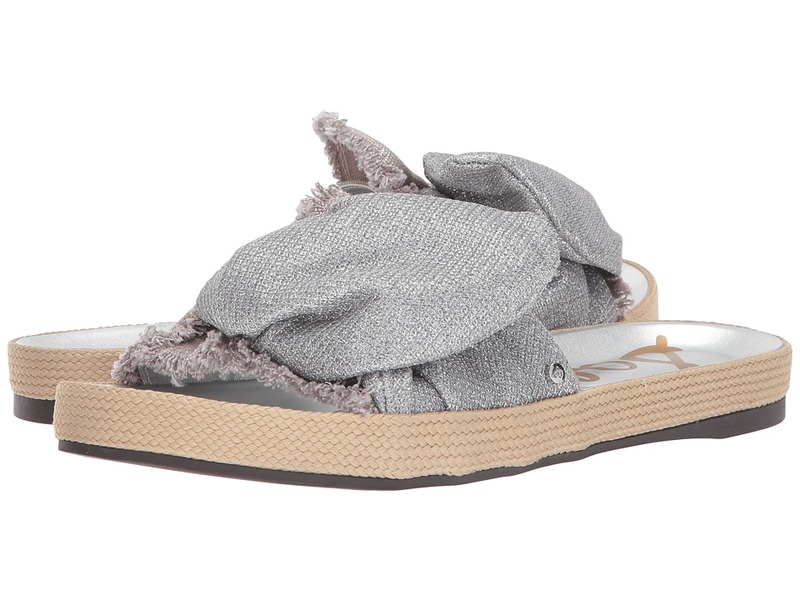 Add a pop of pom-pom to your pitter patter with the Farina flat from Sam Edelman. Supple suede leather upper. Slip-on design with flex collar for all-day comfort. Round-toe silhouette. Pom-pom detail at vamp. Leather lining. Lightly cushioned insole. Micro heel. Synthetic sole. Imported. Measurements: Heel Height: 1 4 in Weight: 4 oz Product measurements were taken using size 7.5, width M. Please note that measurements may vary by size. Weight of footwear is based on a single item, not a pair. Add a pop of faux-fur fun! Reinvent your signature look with the updated classic, introducing the Sam Edelman Haroldson pump. Available in variety of leather and textile uppers. Slip-on design. Point-toe silhouette. Faux-fur pom-pom detail at vamp. Synthetic lining and insole. Double padded footbed. Wrapped stiletto heel. Man-made outsole. Imported. Measurements: Heel Height: 3 1 2 in Weight: 8 oz Product measurements were taken using size 7.5, width M. Please note that measurements may vary by size. Weight of footwear is based on a single item, not a pair. Be admired for your effortlessly chic style in the Sam Edelman Farrow flat! Available in a variety of uppers. Slip-on design with elastic collar for all-day comfort. Round-toe silhouette. Signature logo detail. Man-made lining and insole. Lightly padded footbed. Mini heel with metallic rand detail. Synthetic sole. Imported. Measurements: Heel Height: 1 2 in Weight: 4 oz Product measurements were taken using size 8.5, width M. Please note that measurements may vary by size. Weight of footwear is based on a single item, not a pair. 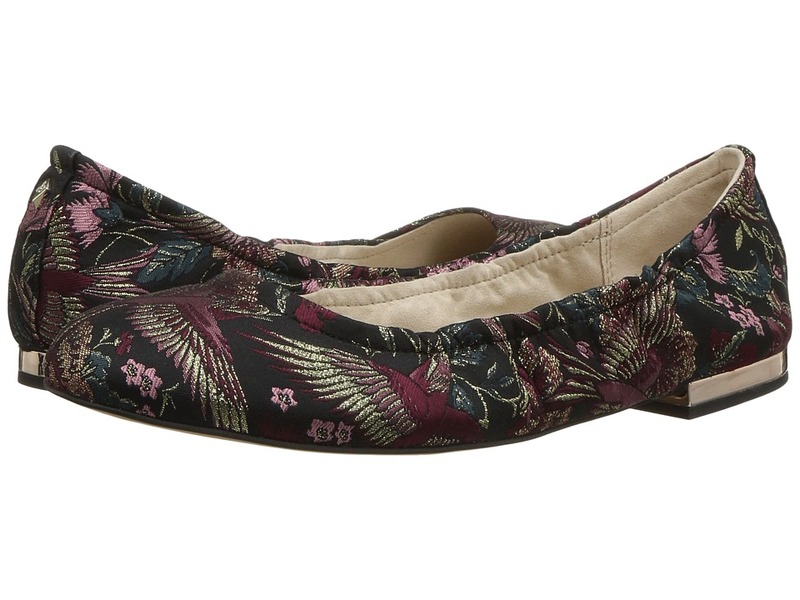 Be admired for your adorably-chic style in the Sam Edelman Farrow flat! 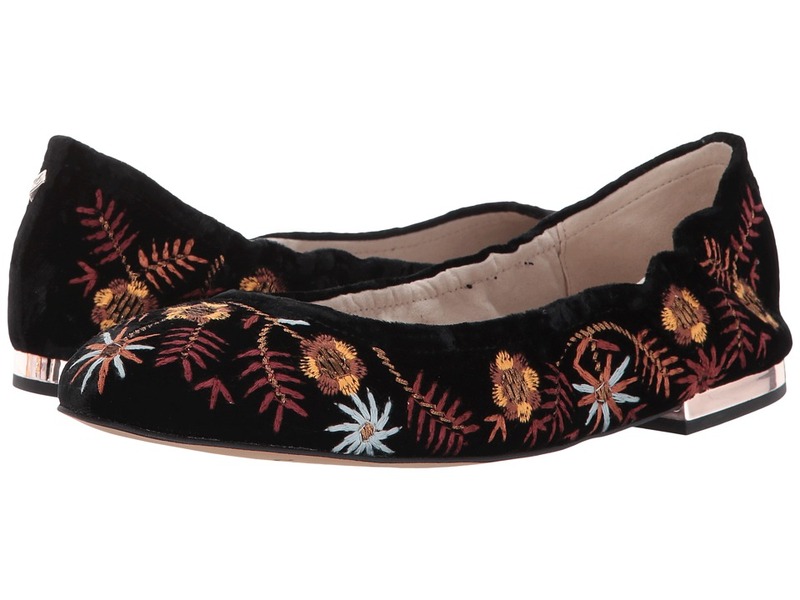 Fabric upper with floral embroidery. Slip-on design with stretch collar. Round-toe silhouette. Fabric lining. Padded footbed. Leather insole. 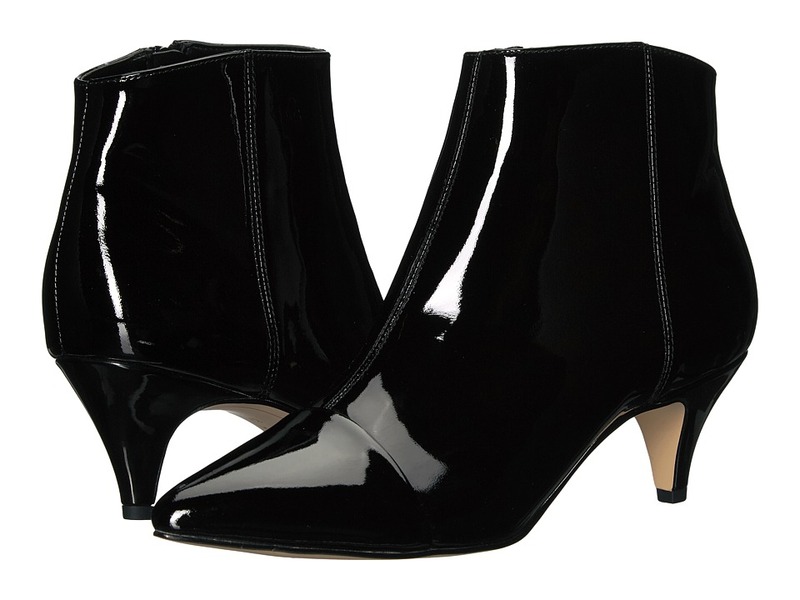 Micro-heel with metallic detail. Synthetic outsole. Imported. Measurements: Heel Height: 1 2 in Weight: 5 oz Product measurements were taken using size 7.5, width M. Please note that measurements may vary by size. Weight of footwear is based on a single item, not a pair. 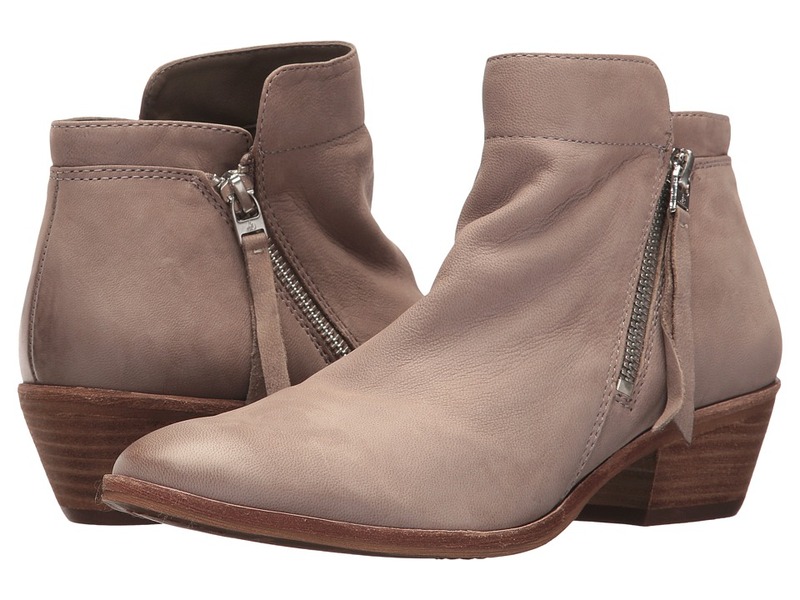 Modernize your seasonal signature look with the sleek lines of the Sam Edelman Kinzey bootie. Available in a variety of premium uppers. Inside zip closure. Point-toe silhouette. Man-made lining. Lightly padded non-removable footbed. Wrapped cone heel. Man-made outsole. Some colorways are made with real bovine hair that has been artificially dyed and treated. Fur origin: Vietnam. Imported. Measurements: Heel Height: 2 1 4 in Weight: 12 oz Circumference: 11 in Shaft: 5 in Product measurements were taken using size 8.5, width M. Please note that measurements may vary by size. Weight of footwear is based on a single item, not a pair. 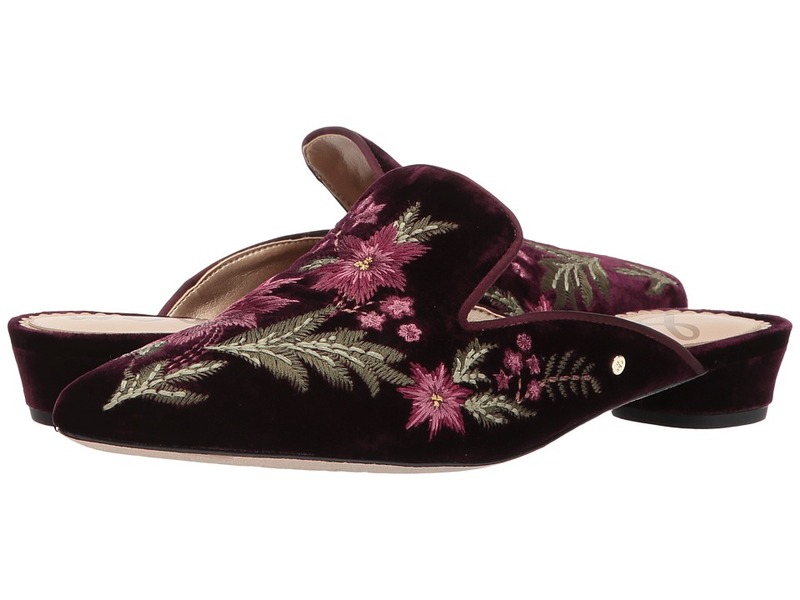 Keep cozy this season with the luxurious Levonne mule from Sam Edelman. Available in a variety of uppers. Slip-on construction. Round-toe silhouette. Faux-fur lining. Comfort cushion footbed. Man-made outsole. Imported. Measurements: Weight: 12 oz Platform Height: 1 1 4 in Product measurements were taken using size 7.5, width M. Please note that measurements may vary by size. Weight of footwear is based on a single item, not a pair. Modernize your seasonal signature look with the sleek lines of the Sam Edelman Kinzey 2 bootie. Patent leather upper. Inside zip closure. Point, cap-toe silhouette. Man-made lining. Lightly padded non-removable footbed. Wrapped cone heel. Man-made outsole. Imported. Measurements: Heel Height: 2 1 4 in Weight: 11 oz Platform Height: 1 4 in Product measurements were taken using size 8.5, width M. Please note that measurements may vary by size. Weight of footwear is based on a single item, not a pair. 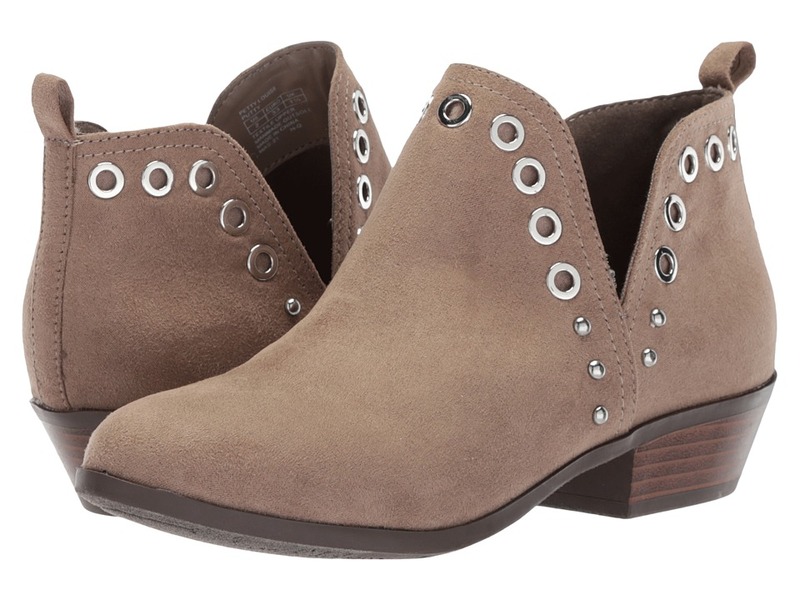 Keep your casual profile fresh with the seasonally stylish Sam Edelman Packer ankle boot! Waxy nubuck leather upper. Side-zip closure with leather tie detail. Round-toe silhouette. Man-made lining and insole. Lightly cushioned man-made footbed. Stacked heel. Man-made sole. Imported. Measurements: Heel Height: 1 1 2 in Weight: 13 oz Circumference: 11 in Shaft: 5 in Product measurements were taken using size 9, width M. Please note that measurements may vary by size. Weight of footwear is based on a single item, not a pair. 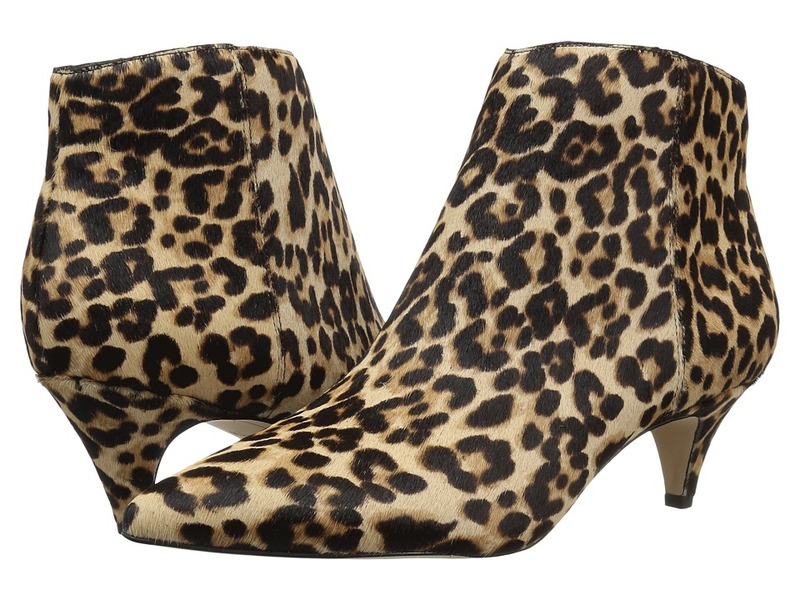 Take your trend-setting look out on the town in the seductive Sam Edelman Sadee bootie. Suede or leather upper depending on colorway. Side-zip closure. Round-toe silhouette. Leather lining and insole. Lightly padded non-removable footbed. Wrapped island heel. Man-made outsole with rubber heeltap. Imported. Measurements: Heel Height: 3 in Weight: 12 oz Platform Height: 1 4 in Product measurements were taken using size 8, width M. Please note that measurements may vary by size. Weight of footwear is based on a single item, not a pair. 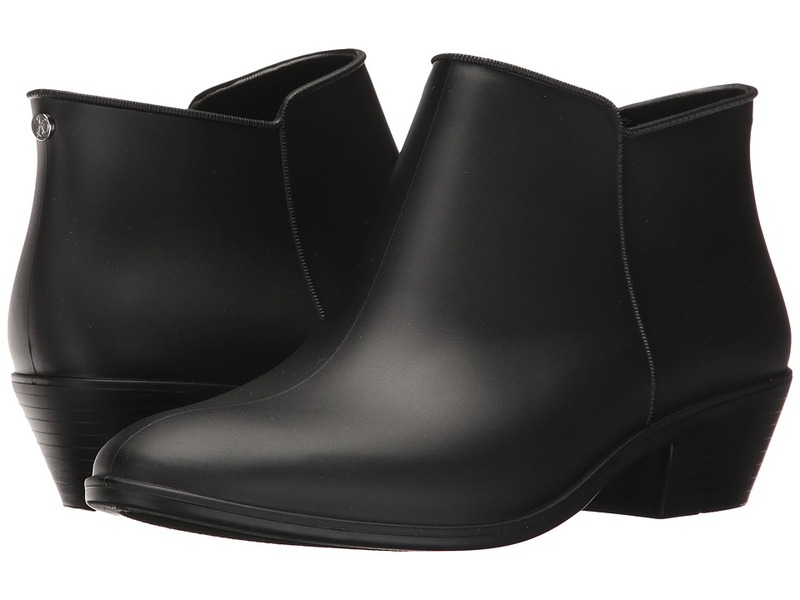 The Petty Rain boot is the perfect match for wet-weather blues! Matte man-made upper. Side-zip closure. Round-toe silhouette. Man-made lining. Cushioned footbed. Molded tapered heel. Man-made outsole. Imported. Measurements: Heel Height: 1 1 4 in Weight: 14 oz Platform Height: 1 4 in Product measurements were taken using size 8, width M. Please note that measurements may vary by size. Weight of footwear is based on a single item, not a pair. 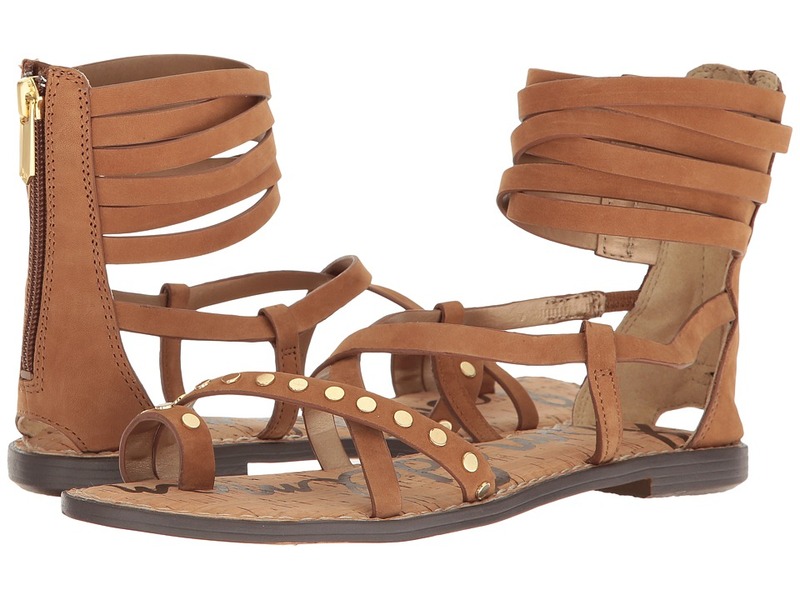 Dominate the summer scene in these daring gladiator-style Gabe sandals! Nubuck leather upper with studded detail. Back-zip closure. Man-made lining. Lightly cushioned man-made footbed. Micro heel. Synthetic sole. Imported. Measurements: Heel Height: 1 2 in Weight: 6 oz Product measurements were taken using size 7.5, width M. Please note that measurements may vary by size. Weight of footwear is based on a single item, not a pair. The Sam Edelman Bodie slide sandal offers a classic design with charming contemporary appeal! Canvas upper. Slip-on design. Loose tie detail over vamp. Man-made lining. Contoured footbed. Rubber outsole. Imported. Measurements: Weight: 8 oz Product measurements were taken using size 9, width M. Please note that measurements may vary by size. Weight of footwear is based on a single item, not a pair. Re-invigorate your signature look this holiday season with the sizzling and seductive Sam Edelman Haide pump. Available in variety of leather and textile uppers. Slip-on design. Point-toe silhouette. Maribou pom-pom detail at vamp. Synthetic lining and insole. Double padded, non-removable footbed. Wrapped stiletto heel. Man-made outsole. Imported. Measurements: Heel Height: 3 1 2 in Weight: 8 oz Product measurements were taken using size 7.5, width M. Please note that measurements may vary by size. Weight of footwear is based on a single item, not a pair. Step out in sporty seasonal style in the Landry from Sam Edelman. Denim upper with suede detailing. Slip-on design. Round-toe silhouette. Man-made lining and insole. Lightly cushioned footbed. Man-made outsole. Imported. Measurements: Weight: 14 oz Platform Height: 1 1 4 in Product measurements were taken using size 8.5, width M. Please note that measurements may vary by size. Weight of footwear is based on a single item, not a pair. A sneaker worthy of her individuality. 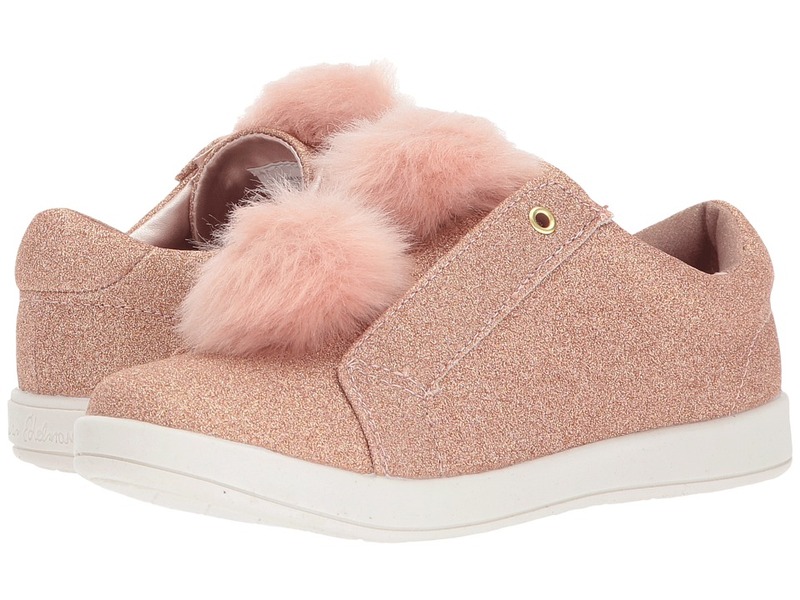 Textile upper features faux-fur double poms for eye appeal. Easy slip-on design. Textile linings. Cushioned footbed. Flexible synthetic outsole. Imported. Measurements: Weight: 8 oz Product measurements were taken using size 2 Little Kid, width M. Please note that measurements may vary by size. Weight of footwear is based on a single item, not a pair. The love of her wardrobe comes from Sam Edelman Kids. Booties in a textile upper. Grommets on upper. Easy pull-on wear. Man-made lining and a cushioned man-made footbed. Stacked heel. Lightweight rubber outsole. Imported. Measurements: Heel Height: 1 in Weight: 7 oz Circumference: 8 1 2 in Shaft: 4 in Product measurements were taken using size 2 Little Kid, width M. Please note that measurements may vary by size. Weight of footwear is based on a single item, not a pair.